Share this product and receive a $1.35 sharing discount. Choo Choo! Give that little lad a VERY SPECIAL ornament this year... that will last a lifetime. Enjoy giving an original hand-painted ornament this Christmas. 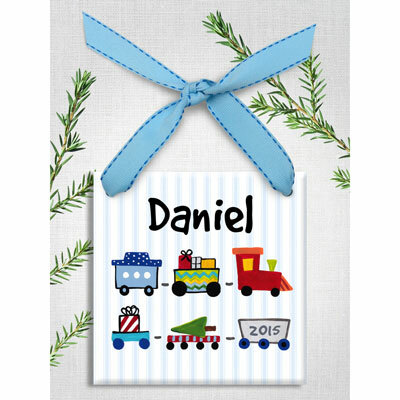 This 4" Square Ornament is personalized and individually hand-finished with a name and year. This ornament is a one of a kind... handpainted and personalized in the US. If you have placed an order and realize you need to change or cancel it, updates must be made by the close of the next business day that your order was placed. 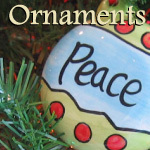 Each and every ornament is hand-painted and signed by Kathleen Virtue. Her trademark is the wonderful detail she gets by using teeny-tiny brushes on each piece. Personalizing every piece with names and dates transforms them from super cute ornaments to treasured keepsakes.